Tasco Sound Star standard headband model ear muffs offer unbeatable value. 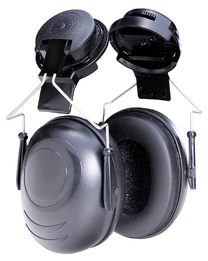 The Sound Star offers the same benefits as the high end Golden Eagle, all in a lower-profile, lighter-weight ear muff. The slim and sculpted design, extra comfortable fit, and attractive colors all help increase worker acceptance. Available in four colors: Blue, Black, Yellow, and High Viz Green. Fits all major slotted hard hats.